This original watercolour caricature by George Cruikshank sold at auction in London last week for a respectable £1,600. The picture is signed in the lower left hand corner but carries no title or date. Judging by the style of the clothing and uniforms, it is most likely to have been produced sometime during the 1820s. The painting depicts a farcically mismatched couple walking together through the park. The young solider gazes down with inexplicable adoration on the smiling visage of a toothless, cross-eyed, old crone. 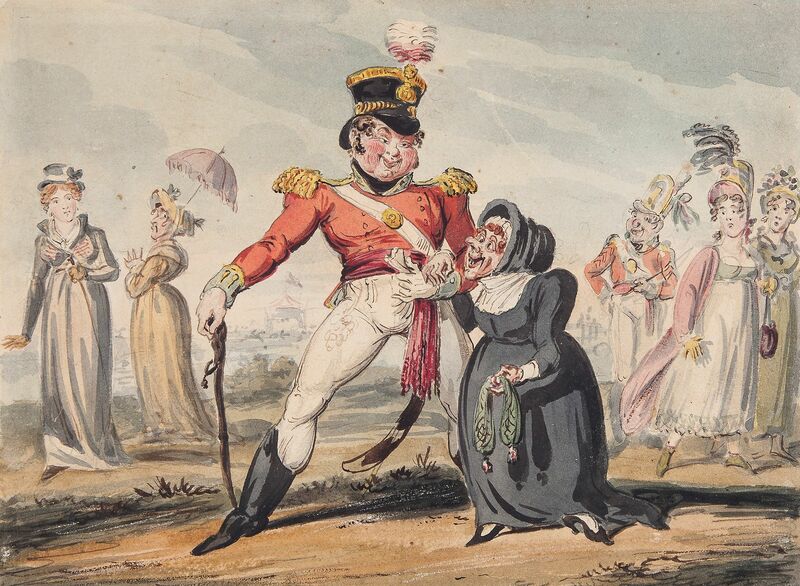 The phallic presence of the solider’s sword and the sagging purse carried by the old woman provide a sly hint of sexual innuendo and more earthy humour. Additional comic effect is also added by the presence of several bemused bystanders, whose reactions to the pair range from amusement, to shock and disgust. Cruikshank was regularly turning out paintings and sketches such as this by the middle of the 1820s. Permanently cash-strapped and aware that his rising reputation had created a demand for original works, he exploited the collecting market by producing countless comic pot-boilers which served to tide him over while he waited for his next big commission from one of London’s publishers. Many of these paintings played on well-worn themes of Georgian humour that would have required little effort on the part of the artist and guaranteed him a quick sale. In this instance, Cruikshank’s humour is a little to obvious for my taste and his handling of the old woman also seems needlessly cruel to modern eyes, but the painting is well-executed nonetheless and will no doubt make a welcome addition to someone’s collection. 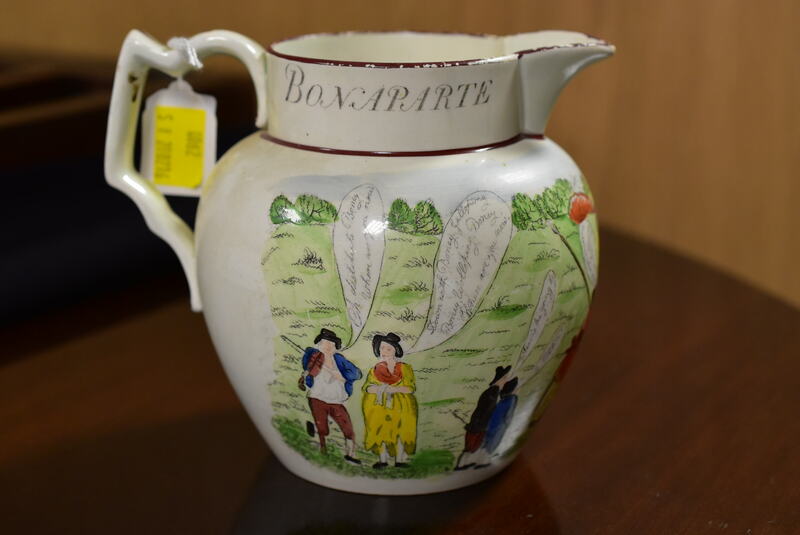 It’s been a while since we looked at any transfer-printed pottery on the Printshop Window and so I thought I’d share these images of a creamware jug which came up at auction recently. 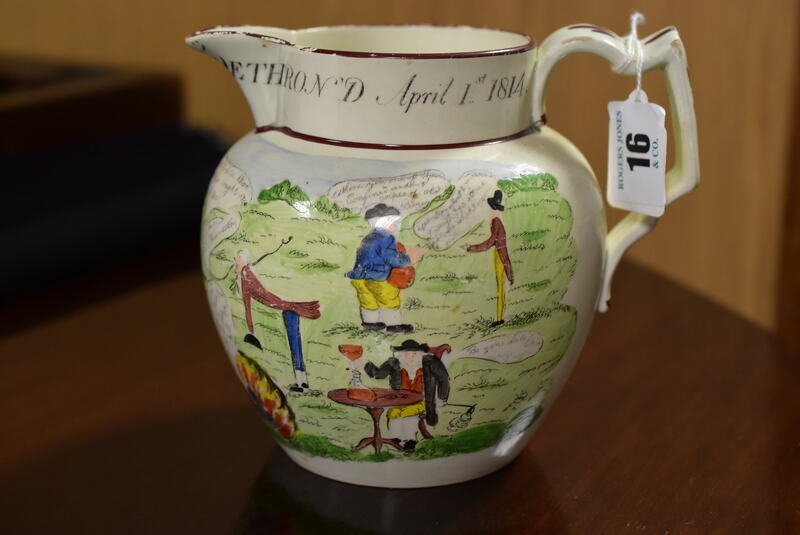 The jug was manufactured by the Cambrian Pottery Company of Swansea and is dated 1st April 1814. The design is somewhat unusual in that it is an original composition rather than a copy of an existing caricature print. It was drawn and engraved by James Brindley, an English engraver working in Swansea for a period of about five years between 1813 and 1818. Brindley produced this image and another satirical design, entitled Peace and Plenty, specifically for use in the potteries. We know Brindley was responsible for creating these two designs because his signature appears on both, although David Drakard points out that it was obliterated from later transfers, possibly because “confirmation that both the design and the engraving was not their own work was too much for the Cambrian Pottery” (Drakard, p.248). 20 stone. You see what I am reduc’d to!” (Broadly, p. 260). 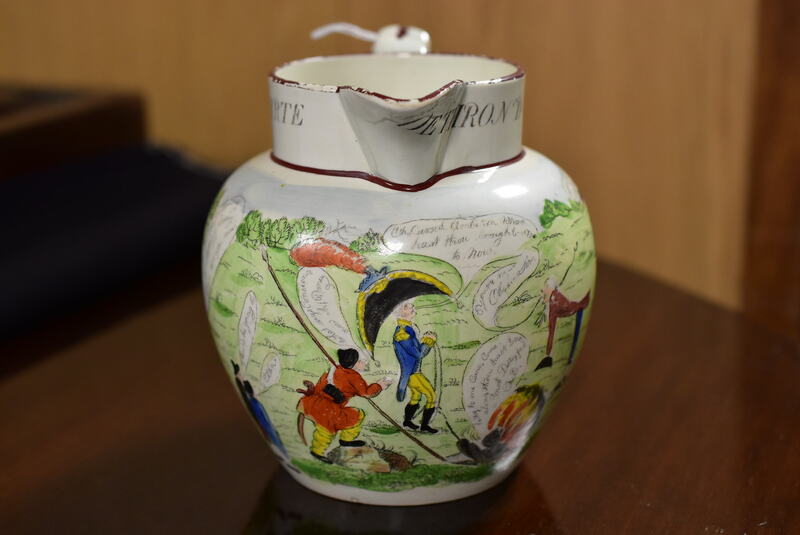 Around the spout of the jug is the title Bonaparte Dethron’d and the date 1st April 1814. Napoleon was actually dethroned by the French Senate on 3rd April 1814, but it seems reasonable to assume that Brindley deliberately fudged the facts in order to link l’empereur’s downfall with April Fools Day. Drakard records that this decoration was issued with and without colour and also printed in red on yellow-glaze (see example here). It was also sufficiently popular for at least one of the Cambrian Pottery’s rivals to issue a copy. The design on the copies is slightly more compact, with the title being moved onto the body of the jug and replaced by a floral banding that runs around the spout. The British Museum currently has one of these copies in its collection which it erroneously attributes to the caricaturist William Elmes. When to our joy, on yester morn, a full pound twelve-pounder – LIBERTY was born… Whilst mother MOB, that steady wet-nurse, press’d the sturdy infant to her milky breast. – Richard Alsop, ‘Infant Liberty Nursed by Mother Mob’, The Echo, with other Poems, N.Y., (1807), pp. 7-8. A rare and highly unusual example of American political satire from the first decade of the nineteenth-century. 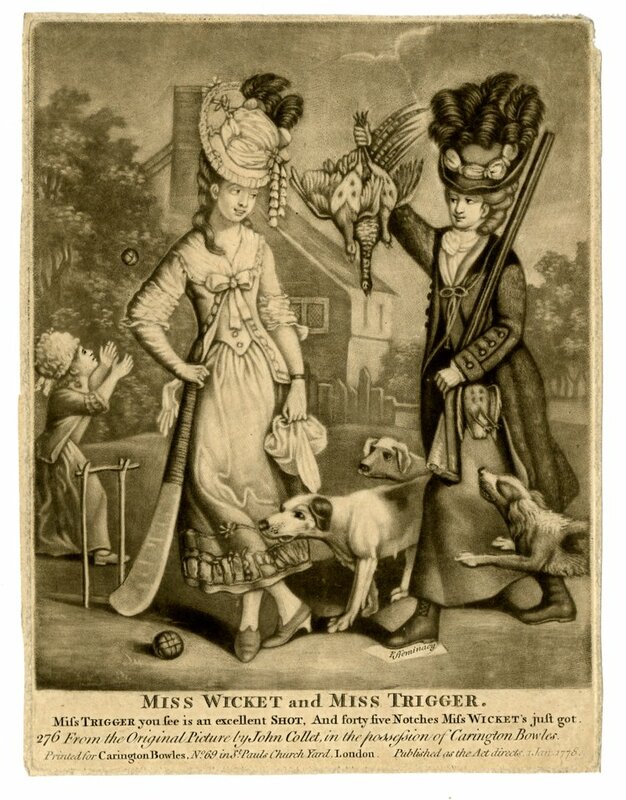 The print was engraved by William Satchwell Leney (1769 – 1831), an Englishman who had emigrated to America in 1805, after a drawing by the American artist-engraver Elkanah Tisdale (1768-1835). 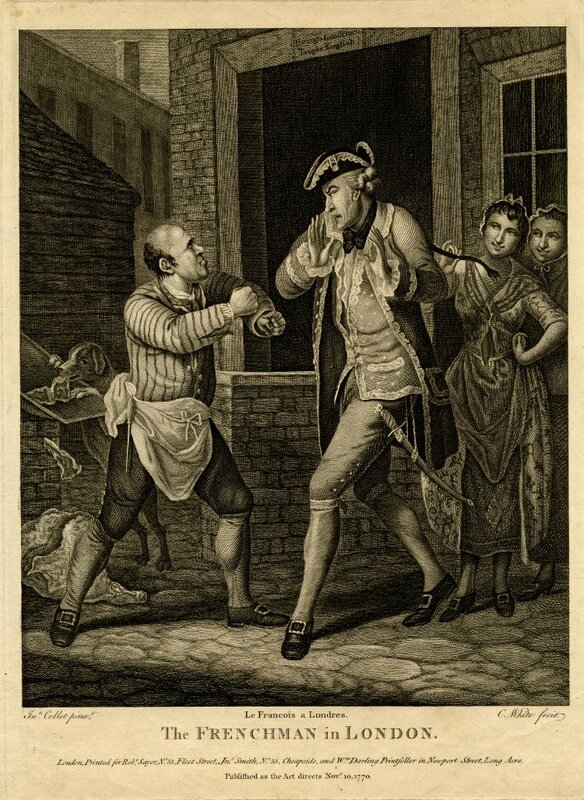 It was published in New York in 1807 and appears to have been issued in two separate states, initially as a bookplate within The Echo, a Federalist satirical journal edited by Richard Alsop, and latterly as a separate print in its own right. It was then republished the following year in Hugginiana, a political magazine named after the outspoken New York Federalist John Huggins. This copy carries the attribution markings for The Echo and came from the initial 1807 edition. The print’s origins lie in the split that occurred in the Federalist movement following successive defeats in the presidential elections of 1800 and 1805. Disillusioned with the democratic process and locked in an increasingly bitter struggle with their Jeffersonian rivals, an outspoken group of Federalists began to call for moves to a more restrictive model of republican government. Their vision was one which was very much derived from the British model of constitutional monarchy, in which a strong executive ruled with the consent of a limited franchise drawn from the ranks of the wealthy and the educated. 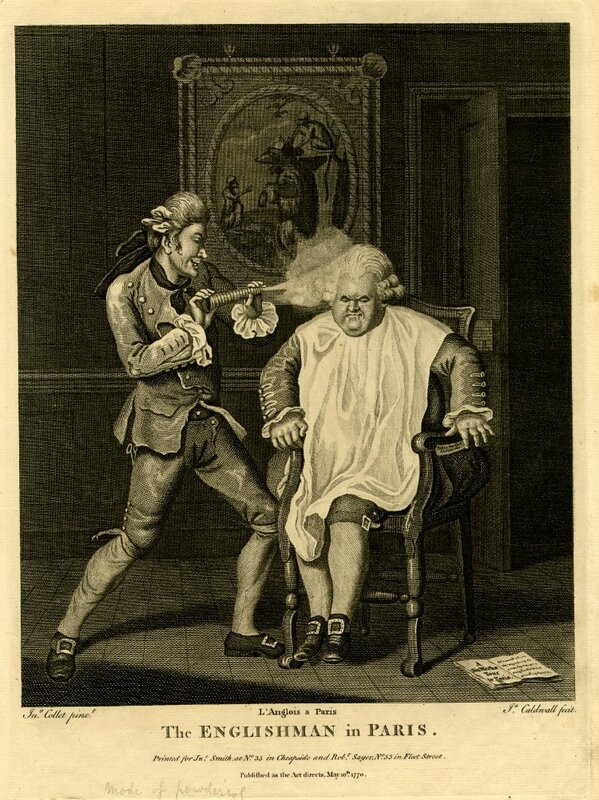 One of the most outspoken of their number was John Huggins, a New York barber and satirical author who put himself at the forefront of the battle with the city’s Republican fraternity. In 1808 he published a collected volume of poems, articles and caricatures (which included a copy of this print) that so enraged his enemies that it moved one Republican activist to storm into Huggin’s shop on Broadway and beat him with a heavy length of rope. The imagery deployed will be familiar to anyone with a working knowledge of English political caricature in this period. 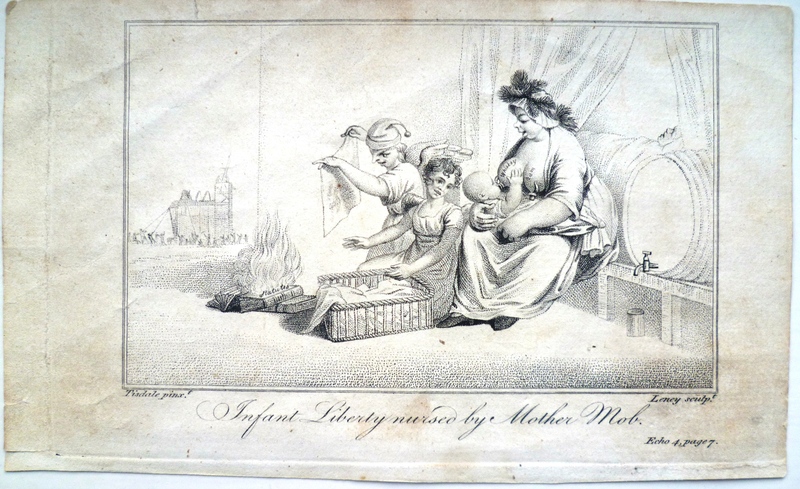 The infant Liberty is being nursed on a diet of whisky and rum by the slow-witted and down-at-heel figure of Mother Mob, a prostitute whose latest customer appears to be dozing in the bed behind her. Two mean-looking republican devils in the guise of children stand next to her burning the statutes and copies of the US constitution. In the background we can see a mob tearing down a state building representing government. The print is arguably one of the most starkly conservative political satires produced in the United States during this period. This print is currently available for sale along with a few other items of American interest. Please click HERE for more information. Figurative Representation of the Late Catastrophe! Surveying the listless occupants of the near-empty chamber of the House of Commons on summer evening in 1837, Benjamin Disraeli idly scribbled a note informing his wife that: “There is no news today: everything is rather flat and the room is thin as the world have [sic] gone to see the monster balloon rise from Vauxhall.” The monster balloon in question was the Great Nassau, a huge hot air balloon which undertook flights from Vauxhall Gardens every evening during the summer season. The Vauxhall balloon was the biggest aircraft in existence at the time and had recently smashed the world record for the longest ever flight, travelling almost 500 miles from London to the German Duchy of Nassau in a time of 18 hours. The balloon itself was spectacle even when it was not airborne, standing 80 feet tall with a circumferance of 150 feet when inflated, it towered over the crowds of awed spectators that thronged to the gardens to see it ascend silently into the heavens each evening. 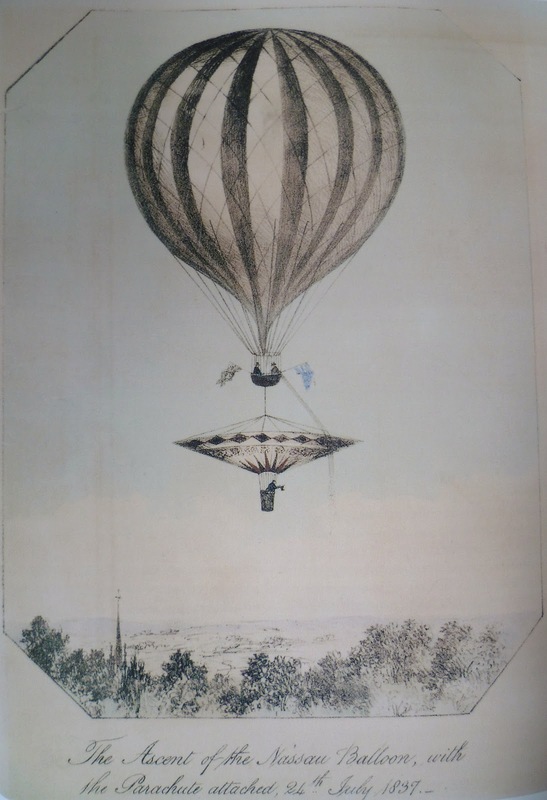 The Nassau was the brainchild of the pioneering British balloonist Charles Green (1785 – 1870). 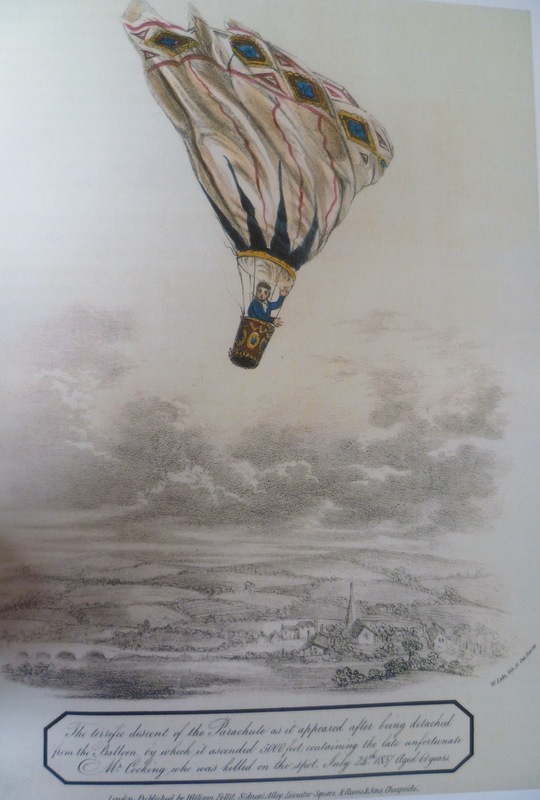 Green completed his balloon ascent in July 1821 and would undertake hundreds more during the course of a 30 year career in aviation. 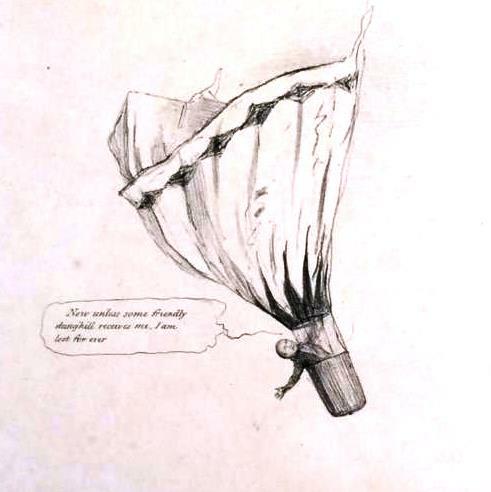 By the time Green retired in 1850, he had designed and built dozens of balloons of various sizes and was credited with the introduction of several innovative new features that made ballooning a safer and more efficient mode of transport. The Nassau differed from his previous creations in that it was purpose-built to undertake long range flights a greater altitudes than its predecessors. While Green was undoubtedly a serious pilot and aeronautical engineer, he also possessed a flair for the theatrical and recognised that the public’s fascination with flight provided a means of funding his experiments. 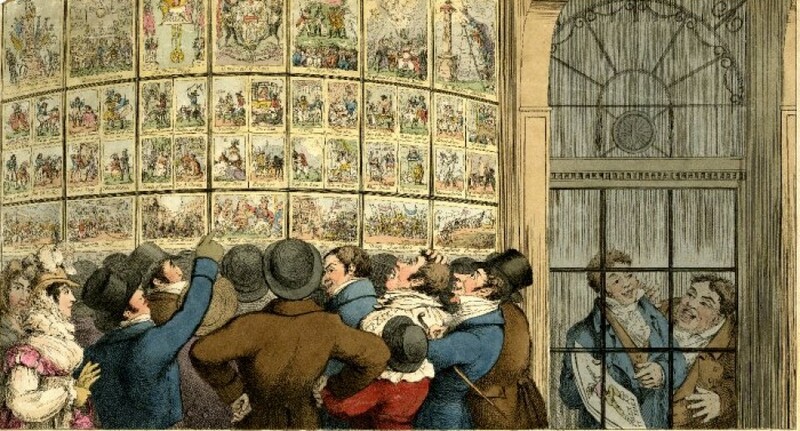 By 1826 he had entered into an agreement with the proprietors of Vauxhall Gardens which resulted in him being offered a nightly slot in their programme of entertainment. His stunts included using his balloon as a floating platform from which to launch firework displays and completing an ascent while mounted on the back of a horse. He also began offering pleasure flights for groups of paying guests, with customers queuing up to pay £21 each (the equivalent of around £2,000 today) to take a short flight across London. This element of the business proved to be so lucrative that Green was able to fund the construction of the Great Nassau using the proceeds. balloon in London large enough to be capable of lifting it off the ground. This was a fact which should have set alarm bells ringing its inventor’s head. I asked him if he felt quite comfortable, and if the practical trial bore out his calculation. Mr Cocking replied “Yes. I never felt more comfortable or more delighted in my life.” Shortly afterwards Mr Cocking said “Well, now I think I shall leave you.” I answered “I wish you a very Good Night and a safe descent if you are determined to make it and not use the tackle” [a rope ladder which would have allowed Cocking to climb out of his parachute and up into the car of Green’s balloon]. Mr Cocking to this question made no reply other than, “Good-night Spencer, Good-night Green. John Doyle, Figurative Representation of the Late Catastrophe! With that he pulled the release mechanism and cast himself off into oblivion. Green had no time to consider what happened next as the balloon, suddenly freed from its heavy cargo, shot upwards like a rocket, eventually reaching a height of 15,000 feet before Green and his co-pilot Mr Spencer could bring it under control and make a safe descent. Robert Cocking and his parachute traveled in the opposite direction with even greater rapidity, dropping towards the Earth like a stone. 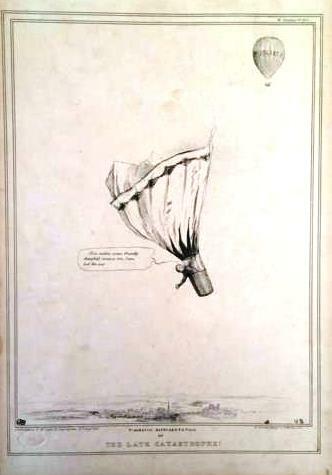 The massive canvas and wooden superstructure of the parachute was far too heavy and simply disintegrated above Cocking’s head. The basket in which the terrified inventor sat detached itself from the mangled remains of the canopy shortly before it smashed into a field in the village of Lee, eight miles south-east of Vauxhall. Although the farm labourers who rushed to Cocking’s aid reported that he was still breathing when they found him, he had sustained massive head injuries and died within minutes of being pulled from the wreckage. Despite the apparent lunacy of Robert Cocking’s actions, his bravery and the public manner of his death caused an outcry of sympathy amongst fashionable Londoners. The young Queen Victoria even headed a public subscription fund to provide for the eccentric inventor’s widow and children. On 31st August 1837 the episode also provided the Irish caricaturist John Doyle with the inspiration for a new plate in his long-running Political Sketches of HB series. In Figurative Representation of the Late Catastrophe!, Doyle depicts the radical MP Joseph Hume in the guise of the unfortunate Cocking. His parachute has been detached from the balloon Middlesex and as he plummets uncontrollably towards the town of Kilkenny, he cries “Now unless some friendly dunghill receives me, I am lost forever”. Hume was a committed radical whose outspoken advocacy of trade unionism, democratic constitutional reform and Irish Home Rule had made thoroughly unpopular with many in the conservative upper and middle classes. When he was ousted from the constituency of Middlesex in 1837 his friend and political ally Daniel O’Connell was able to have him stand for and win the Irish constituency of Kilkenny. Doyle’s print reflects the prejudices of conservative English audiences who typically viewed MPs holding Irish seats, particularly those with large numbers of Catholic voters, with disdain.